Adventure Stage Chicago’s (ASC) Spring production tackles the issues of social inequality and familial, generational, and environmental responsibility in its world premiere of “Sight Unseen: Chapter Two of The Prometheus Project,” written by ASC Producing Artistic Director Tom Arvetis and directed by Rives Collins. Disclosure: Thanks to Adventure Stage for partnering up with ChiIL Mama for years and providing giveaway tickets for our readers and tickets for my family for review purposes. As always, all opinions are my own. Here at ChiIL Mama we loved Spark and can NOT wait to check out the prequel. We'll be bringing the whole family and reviewing shortly. We're also giving away a family 4 pack of tickets ($68 value) to 1 lucky reader for Saturday April 9th at 4pm. Enter early and often through midnight Thursday 4/7. Recommended for ages 8+. 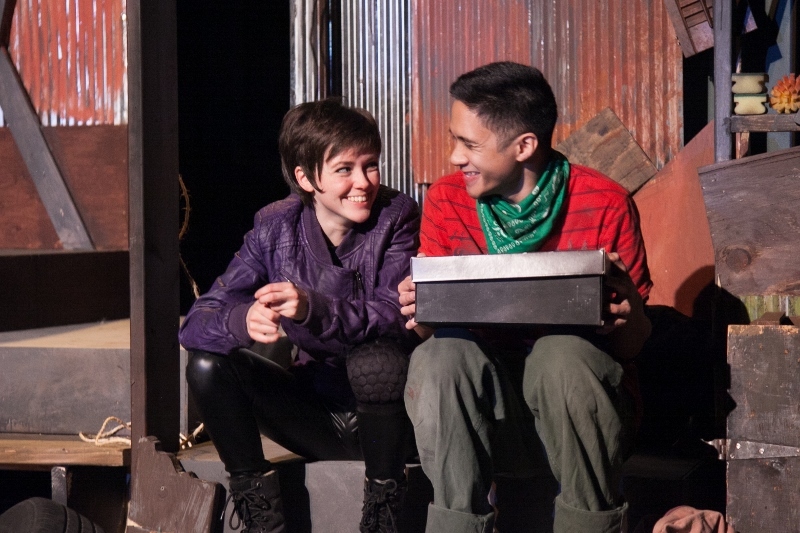 This highly-anticipated prequel reunites the playwright and director from 2014's critically- acclaimed “Spark.” Developed with community input, this piece continues ASC's commitment to exploring the concerns and aspirations of Chicago youth. 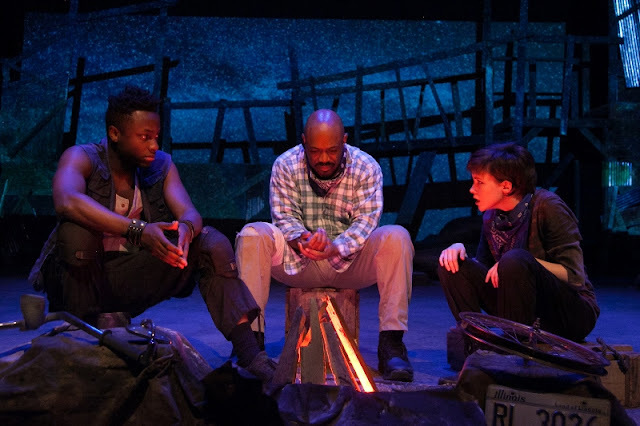 In “Sight Unseen” audience members will follow young brothers Zeph and Kegan in a dystopian future as they struggle to keep their family together in Shambles, a lawless land kept apart from those living in the privileged, fortressed Tower. Their father, Mel, has succumbed to a mysterious illness afflicting only adults. In this world of haves and have-nots, they must navigate a set of ever-changing rules, and determine who is friend or foe on their heroic journey to a place called Sanctuary, which promises a better life. 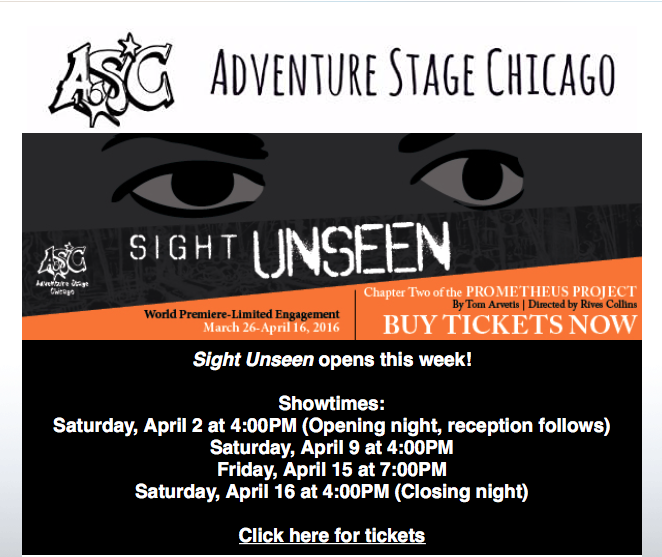 Inspired by Greek mythology and personal stories from young people gathered from Chicago classrooms, “Sight Unseen” explores themes of power, allegiance, and our responsibility to past and future generations. “With ‘Sight Unseen,’ we explore a world set in the future, but many of the issues it addresses are the same one families and communities struggle with today,” says Arvetis. Adventure Stage Chicago (ASC), a program of Northwestern University Settlement House, is a professional theatre production company that creates new work and tells heroic stories about young people. All productions of “Sight Unseen” take place at Vittum Theatre, 1012 N. Noble Street in the West Town neighborhood. Each performance is framed by Curtain Conversations, pre- and post-show discussions moderated by ASC that encourage curiosity and reflection long after leaving the theater. Matinee performances begin at 10:30AM. Adventure Stage Chicago (ASC) creates and tells heroic stories about young people. Uniquely involving our West Town neighbors into the creation process, ASC’s original productions contain themes and ideas that are developed with input from community members. ASC also offers: the in-classroom arts residency program Neighborhood Bridges; Trailblazers, a youth mentoring program for ages 11-15; summer drama camps and drama instruction in Head Start. This is its 12th season. ASC is a program of the Northwestern University Settlement House. The Northwestern University Settlement House opened its doors to its neighbors in 1891 in order to provide an opportunity for a better future. The Settlement’s success results from a commitment to treating every person who enters its doors with dignity and respect, while supporting them with transformational programming designed to interrupt the cycle of poverty. The Settlement has adapted its programming throughout the past century in response to changes in the community, economy and society. The Settlement has led the way in innovative programming by offering residential science and environmental education for inner-city youth, launching successful charter schools and adding a theater so children and teens have a forum for expressing their life experiences. The Settlement’s Adventure Stage Chicago (ASC) is one of the only theaters in Chicago to develop and present works specifically for the middle school–age audience. Adventure Stage Chicago is a member of IPAY (International Performing Arts for Youth), League of Chicago Theatres, Theatre Communications Group (TCG), and TYA/USA.